Few films of any genre regard the body as unflinchingly as Stan Brakhage’s 1971 documentary, The Act of Seeing with One’s Own Eyes. Filmed in a Pittsburgh morgue and graphically depicting numerous post-mortem procedures, the film stands as a work of disquieting, though silent, witness. The title of the film — a literal translation of the word ‘autopsy,’ combining autos, self, and opsis, sight — implies as much, inviting the viewer to participate in the post-mortem, as an observer passively crossing a cameratic Acheron. This filmic approach to cadaverous content strikes at the heart of cinema, as the eerily still subject of investigation is nonetheless multiplied across frames, to produce the image of deathlike stillness in motion. Deborah Levitt traces something like this distinction, between the cinematic and the animatic respectively, over the course of The Animatic Apparatus, an ambitious monograph that far exceeds the scope of film theory, setting out to demonstrate how transformations in the formal status of images parallel popular thinking about existence and embodiment. 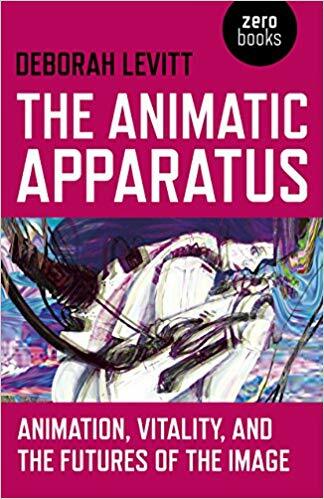 As she notes, ‘life’ and ‘animation’ are practically synonymous in certain contexts; and this book canvases the ways in which contemporary methods of representing motion inform the management of life. Levitt’s thesis as to the biopolitical ramifications of cinema would seem to be vindicated in the very language of its earliest technicians — as she observes, the very first cinema cameras, produced in the late nineteenth-century, were each named separately for the ability of this new technology to capture or disclose something of life itself: the Vitascope in the United States, the Bioscope in Germany, and the Animatograph in the United Kingdom. Levitt writes of the basis for cinema in scientific apparatuses such as the chronophotographic gun, invented by Etienne-Jules Marey in 1882. Capturing its subjects in twelve frames per second, this tool was intended to disclose the motion of the body over the course of so many separately arrested pictures. These representations were allied to therapeutic and disciplinary purposes, Levitt finds, reading a 1914 article in Scientific American on how these images inform both military and athletic training. One may observe a biopolitical management of the body, as so many separate scenes and occasions, in later attempts by Frederick Winslow Taylor to homogenize the physical expressions of an industrial workforce by photographic analysis, Levitt relates. This experiment with cinema as a time-based medium immediately exceeds any representational pretense, one might suggest, where the homogenization of time implied by the succession of equivalent frames models not only the machinic intensity of the assembly line, but the productive time against which labor is divided under capital. In this case, it is not only the image that is alienated. This paradoxical visualization of mobility through immobility is one theme of the aforementioned Brakhage documentary, which ironically imposes a filmic proliferation of frames upon a cadaverous subject, essentially reversing the directionality of Marey’s innovation. Relatedly, in The Birth of the Clinic Michel Foucault describes the clinical reconception of morbidity as a series of “separate, partial, progressive deaths” rather than a definitive event: “vitalism appears against the background of this ‘mortalism.’” Unsurprisingly, Marey’s camera work originates in his profession as a clinical physiologist, as an attempt to arrest, and separate, the moments of a body prior to autopsy. The indexicality of film, its representational relationship to bodies in the world, is taken for granted by many theorists who treat film, Levitt says, “as a material inscription of a real-life situation that, at a particular time and place, appeared in front of a camera’s lens.” While this would appear implicit in the physiological fixation of the medium’s earliest practitioners, it is far from given. Levitt notes an autonomizing countertradition, associated with Rudolf Arnheim’s utopian speculation as to the potentiality of pure film, freed from photographic representation and become “a pure work of man, an animated cartoon or painting.” This ideal, which Levitt refers to as the “animatic” in contrast to the “cinematic,” closely corresponds to Brakhage’s hand-painted films, a kind of free animation comprising a material archive of an artist’s gesture, rather than attesting to the depth of a world-as-stage. Baudrillard’s anxiety before the simulacral flow of digitally mediated images evinces clear ontological priorities. After his description, the cinematic operates on the side of photography, preserving a conceptual distinction between reality and representation. The animatic, on the other hand, does not operate as representation. As a program of self-contained intra-sequentiality, it occludes reality, standing for itself as a seamless surrogate. In Levitt’s account, Baudrillard’s description of simulacra is ultimately beholden to a lost reality. One might pursue this further still, to suggest that Baudrillard’s ambivalently descriptive project remains covertly evaluative. That is, it decides upon ontological difference, proliferating figures of sexual and racial panic, and pathologizing those whose social being evinces an unseemly surplus of signification. For example, in The Transparency of Evil, an entirely execrable mid-nineties text, Baudrillard describes transsexuality as a kind of simulacral kitsch writ upon the body, and immediately conflates this accusation with the supposed transracialism of Michael Jackson, a “solitary mutant” in his estimation. This problem is far from isolated to Baudrillard: every disinterested philosophical conversation that would decide upon false and authentic being should be scrutinized along similar lines, for being is always somebody’s, and not to be ruled upon. Kleist’s marionette is thus itself an animatic apparatus. In Levitt’s account, the animatic describes an absolutely primary involvement of human beings in technological extension, closely akin to what Donna Haraway designates by the term ‘cyborg.’ Notably, Haraway enjoys a near-cameo in Oshii’s film, appearing as a philosophizing forensic analyst who holds forth on the boundary breakdowns that typify cyborg hybridity. The animatic order refuses separation between its elements, in contrast to the cinematic, which depends upon the same. By way of illustration, Levitt offers a descriptive reading of a Chuck Jones cartoon from the fifties, in which Daffy Duck is comprehensively undone and redrawn in a series of slapstick metamorphoses that transpire without the anchor of a fixed visual identity. Here Levitt posits an important secondary thesis, that animation is “an-ontological,” without transcendental ground; and the inconsequentiality of cartoon violence paradigmatizes this incessant movement without any inviolable basis. The animatic body is a virtuality, “coming into and passing out of being without ever inhabiting it.” No longer indebted to the space and time captured by photography, animation is an “industrial art par excellence,” Levitt suggests; a pure production that consists wholly on the side of design. Levitt reads the animatic in the direction of biotech and doll life, looking for precedents in popular visual cultures. But her description of an-ontological virtuality could as soon open onto an entirely different approach, following Deleuze’s suggestion of simulacral disparity through to the idiosyncratic “non-philosophy” of François Laruelle. As Haraway means to denaturalize philosophy, ambiguating its pet dualisms, Laruelle goes further still, attacking the vocational compulsion to decide upon the real in the first place. Laruelle repudiates philosophy as a practice of distinction, or digitization, that conceptually cleaves the oneness of being. What might this have to do with animation? Alexander Galloway’s study of Laruelle, Against the Digital, construes the digital broadly, as denoting various numerical processes of distinction or decision. To these, Galloway opposes a variety of analog operations, identified with “processes of integration or proportion.” At a glance these terms would seem to resonate with too familiar forms of media, such that one might intuitively identify analog continuity with cinematic integrity and the digital with animatic separation. With Levitt and Virilio freshly in mind, however, one could insist on the interrelation of these two paradigms: cinematic photography arrests and separates motion in order to reanimate, such that the animatic principle anticipates cinema, by centuries even. The possible resonance of Laruelle’s work with Levitt’s description of the animatic body has to do with the generative processes attendant upon what Laruelle refers to as “the One.” After Galloway’s description, the digital would denote a conceptual splitting — of reality and representation, say — whereas the analog would encompass the immanent originality of animation. This complements Levitt’s description of animation as “an-ontological,” where the animatic body does not exist outside of the effects of its production. The implications of Laruelle’s language, borrowed from discourses of biotechnology, are intentional: clones may be genetically identical, but exist absolutely independent of one another, as neither a reflection nor a copy. Thus, cloning enacts “a relation without a relation.” This complements Levitt’s suggestion of an animatic body that passes into being without inhabiting it as such, and one could describe the metamorphosing body of Daffy Duck in similar terms, offering an alternative but equally general description of animatic causality. Where causality is concerned, Levitt’s examples of animatic bodies are underwritten by psychoanalyst Daniel Stern’s concept of “vitality affects.” In Stern’s description, vitality concerns the manner in which a movement is performed, rather than its object or intentionality; the “how,” not the “why.” In this context, vitality is an animatic principle of interpersonal attunement, one which obtains in marionette theater and child-parent relationships alike. This projection is exemplified by the virtual idol Hatsune Miku, who began as voice emulation software used in thousands of fan productions, and now performs live as a hologram. The Hatsune Miku phenomenon appears a condensed illustration of Levitt’s argument, insofar as its consistency, as a digitally animated figure performing live alongside fleshly musicians, appears to license a complicated slippage between two conceptual figures, the animatic image and the animatic body. As Levitt explains, the cinematic image and the cinematic body enjoy a relation of distance, whereas animation ambiguates this separation. This produces some conceptual difficulty where Levitt abruptly leaps to discussions of biomedical apparatuses and plastic surgeries. Reading hyper-feminized figures of “techno-Orientalism” alongside televised narratives of gender transition, Levitt produces an unfortunate co-theory, implicitly making a bio-political avant-garde out of trans people, whose embodiment has no more to do with the immanence of the animatic principle to life than anyone’s. This, in fact, is Levitt’s eventual point, and she is careful to address the sensationalization of gender transition by a salacious media. But her discussion of normativity and plasticity can’t but commence from an uneven expectation of physical transgression, part and parcel to a familiar spate of objectifying fantasies regarding trans people. This conception of environment as commensurate with a subject’s action, however dynamic, has the atomizing implication of proliferating private worlds — Levitt names a precedent for Varela’s work in biologist Jakob von Uexküll’s canonical theorization of Umwelt, a rigorously speciated world model projected by each separate being as an adaptive necessity. This splitting of worlds corresponds to the technical irreality decried by dualists such as Baudrillard: and Levitt sees a “post-truth” media landscape, closely identified with the political ascendance of Donald Trump, as attesting to this atomizing implication of the animatic — to each user their own virtual reality. Deleuze identifies Marey’s historic recordings with this fluidity, and the unmaking of whatever static form photography may presuppose. One mustn’t over-identify Deleuze’s theorization of the “movement-image” with the cinematic, and the “time-image” with the animatic; but where the movement-image supposes a certain set of relations in space, the time-image follows a ‘whatever’ logic further still. Deleuze sounds the very inverse of Baudrillard when he describes how the electronic image supersedes its cinematographic precedent: “The new images no longer have any outside,” he writes, but “a power to turn back on themselves. They are the object of a perpetual reorganization, in which a new image can arise from any point whatever of the image preceding.” This self-referential virtuality otherwise resembles Baudrillard’s nightmare, of images submerged in further images, from other screens. Brakhage’s non-photographic films may exemplify this approach, where any frame has a relation of radical originality to any other; a self-facing fractal wall. This is another sense in which Laruelle, otherwise politically quiescent, may complement and extend some of Levitt’s remarks. For Laruelle proposes what we may call a base animacy, a series of irreversible relations, in place of a proliferant virtuality and the vertigo of its self-portraiture. When Laruelle waxes difficult about the prospect of a “a photographer with no camera,” by which he means a philosopher figure intent on multiplying the world after their own designs, he inadvertently satirizes much talk of “worldmaking” as an executive, or affective, enterprise. In this, Laruelle holds fast to a rigorous thinking of the real in the face of de facto virtuality. This would be one direction in which to engage Levitt’s timely provocation; to experiment within a media landscape where seeing and acting are practically identical in their passivity and creativity alike. Where animation as an industrial art broadly concerns the fate of life, the ideal would be for everyone to assume the role of an animator, with the responsibility that this entails. Perhaps one could narrate the movement from a cinematic to an animatic paradigm as an empowering rather than paranoid trajectory; as a movement from passively seeing with one’s eyes to actively producing bodies and ideas.